WebKit – an Apple-developed, open-sourced rendering platform based on KHTML – is picking up steam on desktop. On laptop and desktop computers, WebKit-powered browsers are closing in on Mozilla’s Firefox, which is the world’s second most-popular browser. Look no further than Net Applications’ numbers derived by monitoring more than 40,000 websites in their network (see above chart). Adding May 2011 web usage share numbers for Safari (7.28 percent) and Chrome (12.52 percent) brings us to the combined 19.8 percent market share. If you include the quickly growing mobile, where Webkit absolutely dominates, its numbers are even bigger. That’s just shy of one fifth of all desktop browsing, putting WebKit within spitting distance of Firefox’s 21.71 market share. 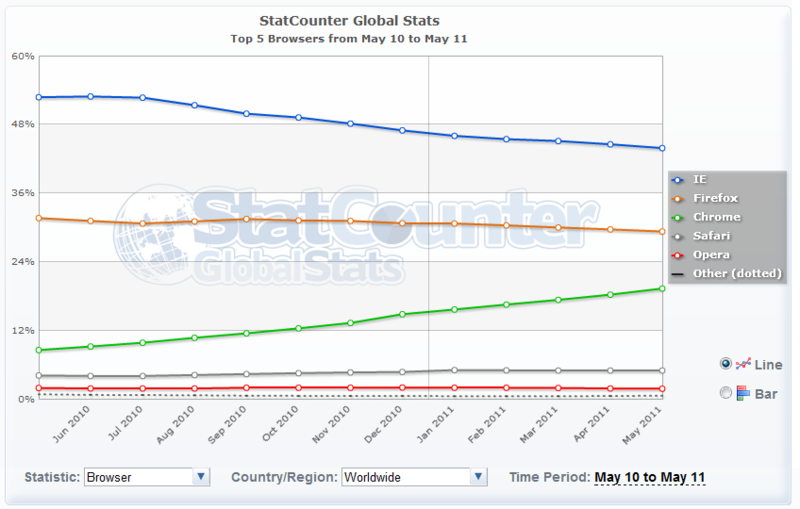 Trends do not favor browser vendors who have been pretty much bleeding market share to Google and Apple in past months. Chrome and Safari have managed to grow their user base over the past couple of months at the expense of Microsoft’s Internet Explorer. Why is the use of WebKit spreading? ConceivablyTech opines (and we agree) that Google’s aggressive marketing push has helped Chrome score major gains recently. The search firm is on the roll lately: They have been airing new browser commercials and even signed up the talents of Lady GaGa for the latest advert. More than marketing, Mozilla should be worried about consumer trends that favor modern browsers which run their favorite web apps smoothly. That’s why Apple has been slowly but steadily growing its market share from 5.09 percent in July 2010 to 7.28 percent in May 2011. Chrome’s growth curve is even steeper, climbing from 7.16 percent in July 2010 to 12.52 percent in May 2011. StatCounter paints a similar picture even though their absolute numbers differ from Net Applications’ data. According to StatCounter, the Chrome browser had global market share of 19.36 percent in May 2011, a 1.07 percentage point increase from 18.29 percent that was reported for April. At the same time, Firefox was down 0.38 percentage points to 29.29 percent, its fourth consecutive drop. Adding Safari’s 5.01 percent market share – which has been virtually unchanged since the beginning of this year – brings the combined Chrome-Safari share to 24.37 percent. This compares to 29.29 percent for Mozilla and corroborates relative rankings from Net Applications. Whichever way you look at it, WebKit-powered browsers from Apple and Google are chipping away at Mozilla at an increasingly rapid pace. Not even the fact that Firefox is the most popular browser in Europe nor the latest GPU-accelerated version are able to revert this trend. Heck, Chrome alone could overtake Firefox by the end of this year to become the world’s #2 desktop browser. It’s a matter of time and no matter how you spin it – that will be a big boon for WebKit, which is already the leading browsing platform on mobile devices. Net Applications also reported that iOS devices now account for 2.38 percent of all browsing on the web.